Biden holds large lead in South Carolina. 'A new Change Research poll in South Carolina finds Joe Biden continues to hold a large lead in the Democratic presidential primary with 32%. one through the rustbelt and one through Texas/ South. Tim Ryan could win Ohio...if he wins Ohio Trump loses . No Republican has ever won the general without Ohio. 'Democratic strategists see two paths to victory in 2020: winning back Midwestern states like Wisconsin and Michigan that narrowly went for Trump in 2016 or southern states with changing demographics such as Georgia and Texas. You can put Tim Ryan firmly in the former camp. The eight-term Congressman, who launched his presidential campaign Thursday on social media and on the talk show “The View,” represents the former industrial hub of Youngstown, Ohio, and he made clear that will be his primary selling point. The day Biden announces give as much as you can to his campaign... I plan to max out. We need Biden to win the primary. He can take the three states we must have...WI,MI And PA where he was raised. He might take Ohio. Biden is the only candidate whom we can count on to stop Trump. I will be driving but will respond as soon as possible to any replies. We can beat Trump...but we need an electable candidate. I find this despicable. ME TO being used as a political weapon againt a decent man. Her story is ridiculous. WASHINGTON -- Our Revolution on Monday announced the formation of its board. The diverse coalition of eleven former elected officials, organizational leaders and grassroots activists join the board to continue the work they started as volunteers and surrogates for Sen. Bernie Sanders’ presidential campaign, mobilizing progressives across the country to transform American politics. Think carefully about this which even if true ( I doubt it) is not me too. 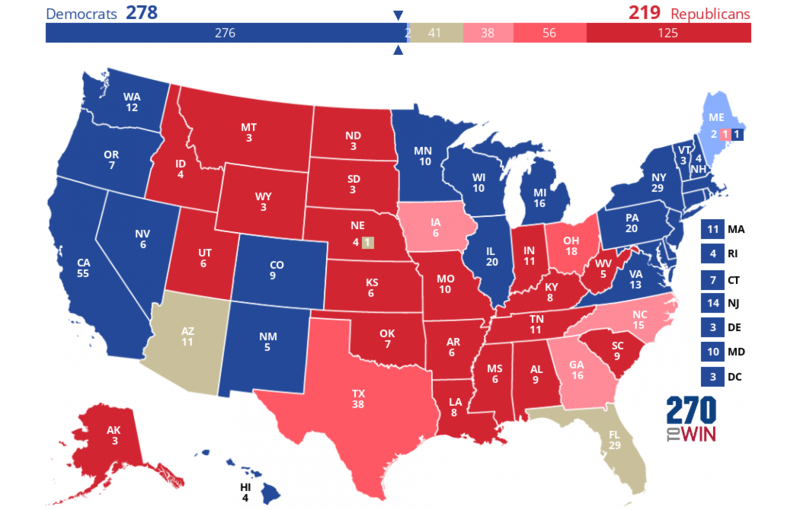 Electoral College Map...we need a centrist candidate to win the rustbelt to stop Trump. Please consider that in 18, it was moderates that flipped the house. We need to attract independents and maybe some anti-Trump Republicans. the election, a Republican governor would appoint the next Senator from Vermont. We need to take the Senate and can not afford to give up Vermont. This is why although I love him, I was glad Sherrod Brown (Ohio) decided not to run. I am not a Sanders supporter for full disclosure. I don't care for Sen. Sanders but even if I did I would be concerned about the Senate. This is hilarious! The GOP claims that Beto reeks of white privilege and is 'out of step' with his (Beto's) party. Hard to believe they expect people to fall for this crap. What are they afraid of? Could a Beto nomination turn Texas blue? witnessed this. Many watching the last moments face ruin and bankruptcy as there are not enough jobs to go around. MY son (twenty something) was lucky he was sent to Indiana last summer. Lordstown GM closed because of steel tariffs. Donald Trump is to blame. It is simply to costly to make small cars in this country anymore-the tariffs combined with the poor sales of small cars sent the jobs overseas...and thousands will lose their jobs a result. The next time we have a gas price increase. Non-American workers will make the money. Foreign nations will profit and not us. The country that gave us automobiles will not longer manufacture them. It really is a dark day in the Unite States and does not bode well for our future. Below is information about the plant. And so it begins...the beginnig of getting Trump out of the People's house.